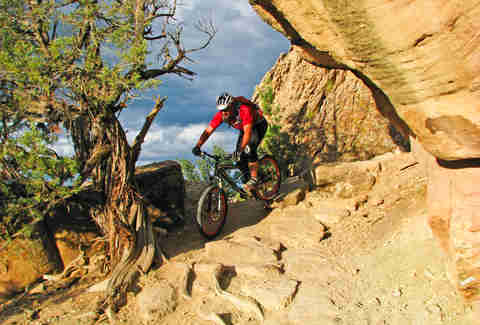 As mountain bikers and hikers flock to Moab for their outdoor fix before winter hits, Grand Junction, surrounded by the Grand Mesa, Colorado National Monument, and the Book Cliffs, offers its own surfeit of scenery accessed by foot and two wheels, not to mention a surprising collection of breweries and piquant eats. Some of us are so dead set on gunning it across the border that we don’t notice the stunning panorama from pretty much anywhere you stop in and around Grand Junction. That said, here's why you should consider Grand Junction for your next trip. 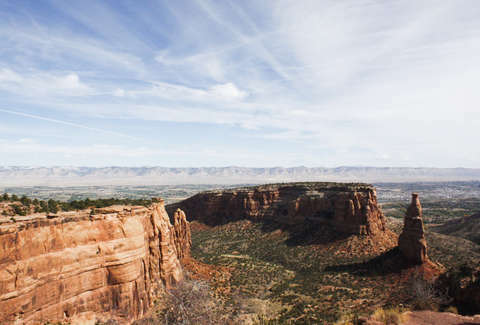 At least an hour closer than every park in Utah, Colorado National Monument offers more than 60 miles of hiking trails, each opening to either a panorama of the entire Western Slope or a view of spectacular rock formations. These include the Coke Ovens, Pipe Organ, Kissing Couple, a collection of natural arches, and what looks like a batch of massive phalluses but is officially dubbed Devil's Kitchen. The few trees that lie in the valleys throughout the Monument are rife with color throughout the fall. Trails range from hour-long out-and-backs to full-day canyon treks. 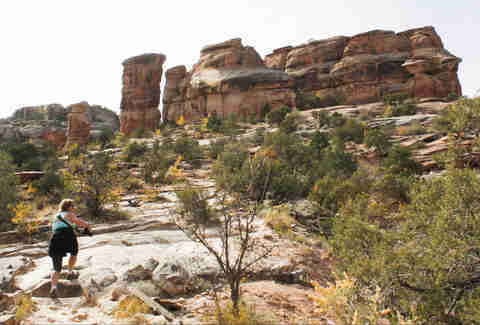 Saddlehorn Campground is located at the top of the Fruita side of the park, and backpackers can pitch a tent deep in the remote corners of the canyon. On the other side of the valley, Mount Garfield is the most prominent peak you see (on your right) upon arrival into Grand Junction. There’s a sparsely frequented trail on it that makes for a strenuous but exhilarating two-mile schlep over fortified sandstone to the 2,000ft summit. The two-way paved road that winds through Colorado National Monument is delightfully light on vehicular traffic this time of year. 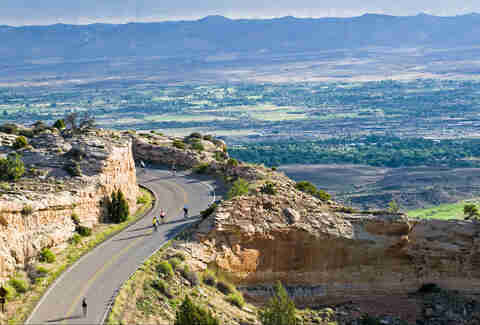 Rim Rock Drive stretches for 23 miles through the red sandstone cliff walls between Grand Junction and Fruita with just over 2,000ft of climbing, plenty of adrenaline-fueling hairpin turns, steady climbs, descents, and viewpoints of every rock formation in the canyon. Another option for roadies or casual cruisers is the Colorado Riverfront Trail, a nearly continuous (save for a handful of short detours) paved path paralleling the Colorado River that connects Palisade, Grand Junction, and Fruita, a span of 28 miles. It's almost entirely flat, taking you through wetlands, botanical gardens, and within stumbling distance of Edgewater Brewery, a great place to grab a pint and take a breather. And how about some mountain biking? Most riders go to Fruita to get their Fat Tire fix, but two miles from Grand Junction’s Main St lies some of the most technical singletrack in the area -- the Lunch Loop (aka Tabeguache) trail system. These trails don’t mess around. Although most are designed to ride in an hour and a half or less (during a lunch break), they take you up and around ridgelines, sometimes within centimeters of 300ft precipices along the aptly named Widowmaker Hill. There’s also a bike park where locals can be found catching serious air, and a couple of newer trails that make you feel like less of a wimp bearing names like Kids Meal and Big Sister. Fruita offers classic desert riding that blows away anything you’d find in Moab, and is totally non-motorized… i.e. free of overzealous noobs in Jeeps. If you do want to ride to Moab and get there entirely on dirt, the 142-mile Kokopelli Trail begins at the Loma exit, which is also home to dozens of miles of rolling, rocky trails above the Colorado River, including the beginner-friendly Mary’s Loop and the considerably more challenging Troy Built. On the other side of Fruita, 18 Road offers an awesome BLM camping area and a series of multi-level trails running through the sand at the base of the scenic Book Cliffs, as well as some more strenuous routes up and down the steep and sandy ramparts. You want great food? 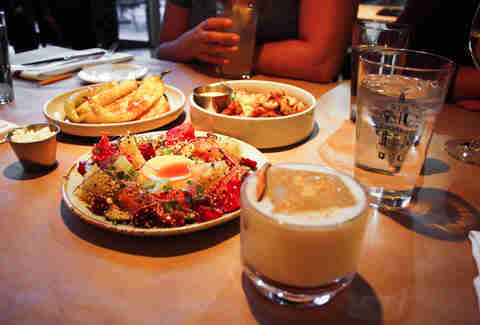 You got great food. Some might think that Grand Junction is cooking up little more than steaks, but as the agricultural treasures of the area might suggest, there's a bountiful offering of farm-to-table fare. At Bin 707, chef Josh Niernberg is such an enthusiast about it that he grows microgreens in his office and sources as many ingredients locally as possible, including seasonal specialties like the honey-glazed banana peppers, heirloom tomato salad, and buttery plum cobbler. He’s done so well for himself that he’s opening a taco joint and a supper club in 2017. If you like your burgers still bleeding, head to 626 on Rood, where beef is sourced from Roan Creek Ranch down the road and all dishes come with an array of creative and sumptuous sauces. The best brunch spot is Dream Café with its small menu of mimosa and Bloody Mary varieties, gigantic cinnamon rolls, and gut-bomb Benedicts. Café Sol is a lunchtime standout with its massive paninis, fresh soups, and salads. And beer. So much beer. In a place that is world-renowned for its peaches, it’s no wonder that other fruits also thrive here. Grand Junction and Palisade are home to 23 wineries and tasting rooms (free tastings! ), and many of them are conveniently nestled together. The best way to work your way through the gauntlet is via cruiser bike. Talon Winery prides itself on its Western Slope-grown classic varietals, while St. Kathryn Cellars next door has figured out how to yield booze from not just the obvious local ingredients like cherries and peaches but also from elderberry and lavender. For more discerning palates, Grande River, Plum Creek, and Two Rivers each offer a rustic-chic ambiance and an equally pleasing dry riesling. Though known more for its grapes, Grand Junction sees a gregarious role played by its grain. After churning up dirt in Fruita, Suds Brothers Brewery offers a soothing pint of hefeweizen or black and tan along with tasty pub fare, including a can't-miss barbecue pork sandwich and fish tacos with a surprising but not untasty pico de gallo/wasabi sauce. 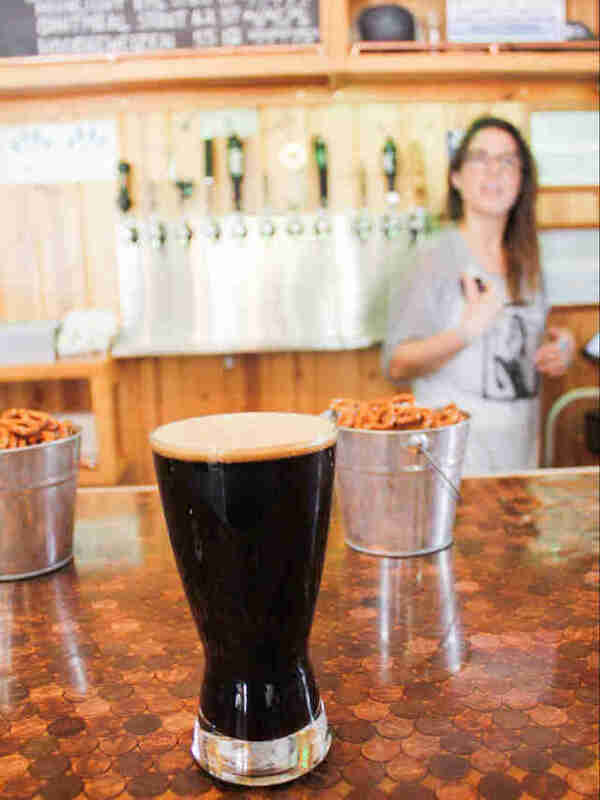 Also in Fruita, Copper Club is a bare-bones brewing joint where you can bring your own food and sip stout while playing darts. The Colorado Mesa University crowd flocks to Kannah Creek in Junction for the 13 brews on tap, while Rockslide on Main St rocks out a decent Oktoberfest along with a huge food menu. Compared to Moab, Downtown Junction is a mecca of culture, with fun shops (a great vintage candy store and also a shoe palace full of Euro brands), carefully vetted art (bronze statues on every corner), and a selection of pubs that includes a blues joint (Ella’s Blues Room), a high-end French spot with live jazz music (Le Rouge), and a tequila bar (MX), all appealingly devoid of Mormon influence. All of that, plus everything else we've dutifully laid out here, makes Grand Junction the ultimate getaway you never knew you needed. See you on the trails! Shauna Farnell is a Denver-based freelance writer and outdoor enthusiast who believes that Grand Junction is waayyy better than Moab. Follow her on Twitter @shaunafarnell.